Can you take off your partisan hat long enough to discover something so vital it will substantially improve your performance and your business? If you’re nodding “yes,” please read on. Every four years Americans (and those who pay attention to American politics) are treated to one of the best living laboratories of marketing and branding anywhere: the race for president of The United States. In the POTUS contest, we find a zero sum game that is won or lost based on the allocation of three non-renewable resources: dollars, attention, and votes. If I had more time, I could effectively argue why the function of the candidates themselves (i.e., where they stand on the issues) is not the main reason why most get elected. Instead, it’s the power of their brand value and their ability to distribute that brand message through technology. Between 1933 and 1944 Franklin Delano Roosevelt enthralled American citizens with his “Fireside Chats.” Of course, what we know today is that by harnessing the newest outreach technology of his time—radio— FDR cemented his position as a media master. In 1960, candidate John F. Kennedy also mastered a nascent technology when he beat Richard Nixon for the presidency. Historians attribute JFK’s win to his superior performance in the first televised presidential debate. Ironically, those who listened to the event on radio said Nixon won the contest, but television viewers gave the victory—and the presidency—to JFK. In 2008 and again in 2012, an almost unknown candidate with an unlikely name, Barack Hussein Obama, rode his media mastery all the way to the Oval Office. In this case, it was Obama’s understanding of the Internet and how to use the emerging technology to attract both dollars and devotees that assured his successes first over John McCain and then Mitt Romney. And in 2016, Donald Trump is again using new tech—in Trump’s case, reality television and social media—to win his party’s nomination (the presidency has not yet been decided). In all four of these instances, it was the early adoption of the most popular and available communication technologies of the time that helped their masters to victory. But a deeper look reveals that the key to their success was something else. It was these candidates’ profound understanding of their audiences that gave them their advantage. In each case, the candidates displayed a clear “All About Them” strategy that made their supporters feel good about themselves. In FDR’s case, it was his famous quote, “We have nothing to fear but fear itself.” These simple words empowered Americans battered by the Great Depression and frightened by the rise of both Nazi power in Europe and Japanese aggression in Asia to move forward into the global reality with confidence. Likewise, JFK’s vision of Camelot, expressed in both his words and his movie star visage, also empowered Americans to embrace hope and opportunity. Obama did the same with his now famous three-word mantra, “Yes we can!” Obama’s line was positive (“Yes”), inclusive (“We”), and aspirational (“Can”). “Yes we can” may go down in history as the second or third best advertising line ever written. Even Donald Trump—who has taken a decidedly more negative approach to his communications than the previous three—makes his followers feel better about themselves. After all, if a successful billionaire such as Trump can speak as despairingly as he does about women, Mexicans, Muslims, disabled reporters, Jews, and other minorities, then perhaps less successful people who have said (or thought) the same things can feel better about themselves for what was heretofore unacceptable behavior. 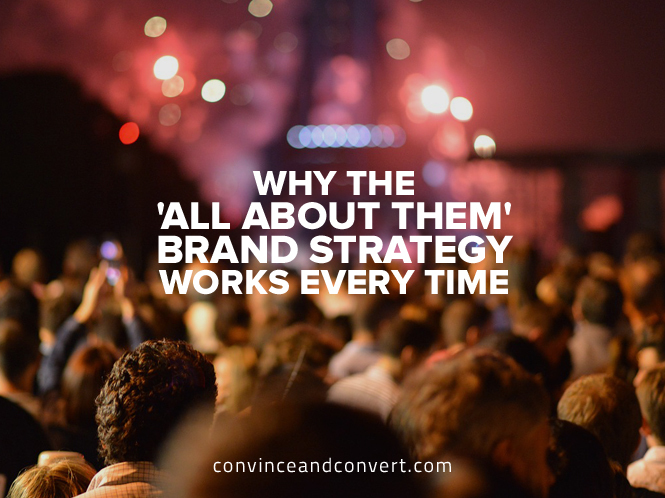 The idea of creating an “All About Them” brand can be summed up this way: A good brand makes people feel good. A great brand makes people feel good about themselves. Powerful brands from Apple to Zynga have used this simple yet profound formula to create the transformational brand value that generates enormous shareholder value. Powerful politicians use the same effective know-how to win their seats. And you can do it to build your personal and professional success, too. Bruce Turkel is the branding expert who helps make his clients’ brands more valuable. Bruce has worked with great companies including Nike, Discovery Channel, HBO, Bacardi, Hasbro, SC Johnson, Humana, and the Miami and Puerto Rico Tourism Authorities. In All About Them, Bruce uncovers a proven step-by-step system to build your brand and build your business in a world where success requires you to turn the lens around and focus relentlessly on your customer.